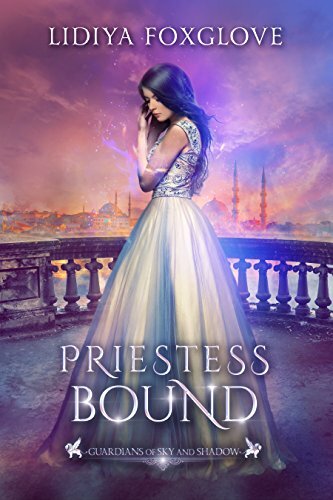 Priestess Bound, Guardians of Sky and Shadow book two written by Lidiya Foxglove. The book picks up where it left in the first book, and we find Phoebe in the Emperor’s palace. Locked in a room with shackles on she doesn’t know what to expect. Being separated from her three guardians and knowing who the fourth is doesn’t give her much relieve or hope. Now she has to find a way to leave this place. Only there are a few problems. Who is the bad guy, who wants her dead, the elders, the king? Nothing seems as it is. One good thing about being captured, she found Himika, the sister of Rin (Raio) the lover of one of her guardians. Now she needs to get away, save Himika and make it back to her guardians, convince the last guardian that he is meant to be with her and then save the world from the monster. Only nothing is that simple, being the priestess is great, being a channel for magic sounds nice right? She knows that she is only that, wishing that she was more. Will she be more? I liked book two so much. Writing style is great, story is amazing. I like the plot twist and where the story goes. And I really like the difference in the man, how they all have other characters and that there isn’t the traditional part with they all have to love her, that there is another relationship going on. It gives something else to the story, don’t really know how to explain it. The MC grows in this book so much, she becomes from a young shallow woman to a strong woman who knows what she wants. The man around her are fun and all treat her different. I really like these books. I like this writer and can’t wait to the next book that will come out in June.